Successfully Added Car Rearview Camera (Nightvision, Waterproof , US License Plate) to your Shopping Cart. Car Rearview Camera (Nightvision, Waterproof, US License Plate) - easily installs onto the back of your vehicle for a crystal clear and wide-angle display of everything behind you. Day or night, this handy rearview camera is perfect for protecting yourself and your passengers from unwanted accidents or car damage during parking. 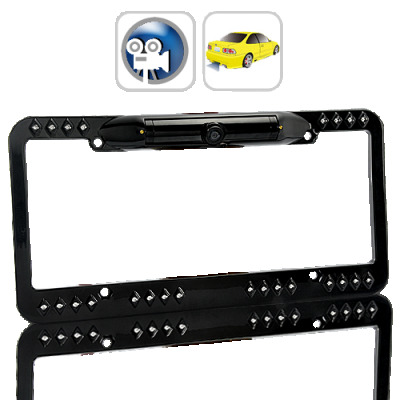 The camera and frame is a quick installation and easy fit under your current license plate. Simply install this camera onto your rear license plate, connect the video cable to the AV in on your car DVD or portable PMP and then the power lines to your car battery. That is all! And it is completely waterproof so you can use it in all types of weather conditions. Even better, with its 24 LED lights for automatic infrared nightvision, this rearview camera is ready at any time. Once you install it, you can just leave it on and never worry about it again! This Car Rearview Camera uses an RCA connection that connects to your Car DVD Player (or GPS Navigator, LCD Monitor, etc.) for a 130 degree wide angle view and 720x576 resolution display of everything behind you. It is powered by the tail light power source, so when the car is in reverse the rear view screen will automatically turn on. Also, when viewing your display monitor, a measurement like graphic will appear to help you estimate distance. Talk about convenience! This Car Rearview Camera is compact and an easy DIY installation (do-it-yourself) accessory that makes parking and reversing much safer. Available in our warehouse now, order yours today and we'll express ship it out tomorrow. Brought to you by the leader in China Electronics - Chinavasion.